Action Alert! Engineers Week 2015 Resolution Introduced-Contact Your Representative Today! On February 20, 2015, Representative Daniel Lipinski (IL-3) introduced the 2015 Engineers Week Resolution. The bipartisan resolution, H. Res. 119, supports the goals and ideals of Engineers Week, which is being celebrated February 22-28. NSPE worked closely with Representative Lipinski to introduce this important legislation. Please take action today and urge your Congressperson to cosponsor H. Res. The Federal Emergency Management Agency (FEMA) has issued proposed “Revised Guidelines for Implementing Executive Order 11988, Floodplain Management.” Interested and potentially affected NSPE members who could be impacted by this guideline are encouraged to learn more about the proposal and provide comments here. Comments must be received by April 6, 2015. On February 2, President Obama unveiled his annual budget request for Fiscal Year 2016, which will begin on October 1, 2015. The $4 trillion proposal represents the president’s vision and agenda for the next year. However, Congress is solely responsible for passing an annual budget and the president’s request, which was immediately panned by the Republican majority, is not in any way binding. The House and Senate Budget Committees will set forth their respective budget resolutions in April. 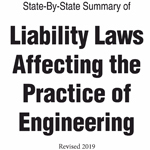 On January 15, NSPE submitted a public comment in conjunction with the West Virginia Society of Professional Engineers on proposed rules for aboveground storage tanks, stressing the importance of using qualified PEs for the required inspections (and reminding them that this is also precisely what state law requires). The morning after the midterm election, one fact is certain: Republicans had a huge night. As some races have still not yet been called, we don't quite have the full picture. However, with the GOP reclaiming the Senate by a wider-than-expected margin, picking up over a dozen seats in the House and making sweeping gains in gubernatorial races and state legislatures, the political landscape is markedly different than it was yesterday. Midterm Elections Near: Contribute to NSPE-PAC Today! With the 2014 midterm congressional elections only a month away, NSPE-PAC is diligently working to ensure that this election is a success for professional engineers. Recent recipients of NSPE-PAC contributions include Rep. Sam Graves, R-MO (leading figure on federal procurement policy and infrastructure), Rep. Joe Kennedy, D-MA (leading cosponsor of Educating Tomorrow’s Engineers Act), Rep.
On September 29, NSPE President Harve Hnatiuk, P.E., F.NSPE, sent a letter to the Pennsylvania House Committee on Professional Licensure to comment on a bill (HB 1447) that could repeal Pennsylvania’s industrial exemption. The bill is set to be heard by the committee on October 8. Hnatiuk wrote: “This hearing presents an opportunity to address the need to amend P.L. 913, No. On September 15, NSPE as part of the Coalition for National Science Funding, sent a letter to the Senate Commerce, Science and Transportation Committee supporting Chairman Rockefeller’s recent introduction of legislation to reauthorize the America COMPETES Act for five years. In particular, NSPE commends this bill’s acknowledgment of the importance of the National Science Foundation (NSF) and its commitment to sustained investment in all fields of engineering.